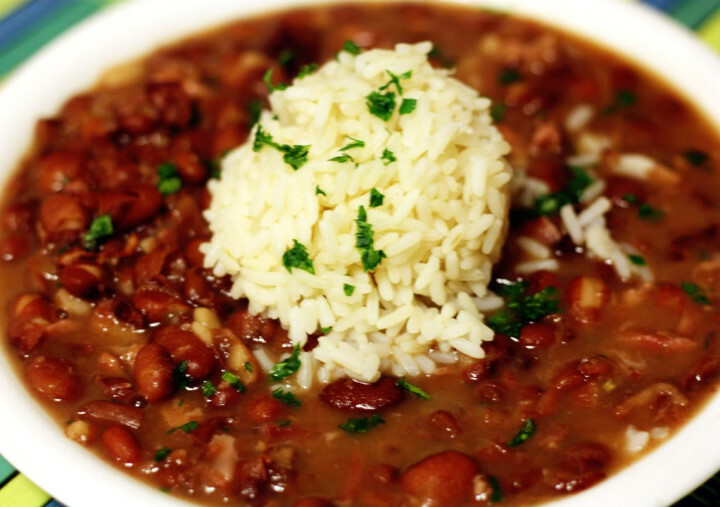 There are many ways to prepare Red Beans & Rice. Making them from scratch is very good but too much effort for me. Hereâ? ?s my approach. After washing and sorting over Red Beans soak them overnight (you donâ? ?t have to itâ? ?s just what we were always taught). Start off with 2 Â½ cups of water for every cup of beans (remember they expand), cook covered in sauce pan at a simmer. Add seasoning, we use Joe’s Stuff (regular or hot), use about a Â½ teaspoon per cup. Joes Stuff is a seasoning mix with no MSG and very little salt (50mg compared to 200-300mg in most seasoning mixes). Add slices of smoked sausage and cook until tender but firm (2-3 hours) I like to do a high heat sautÃ© in a separate pan then add around Â½ cup sausage for each serving. Serve over rice (we traditionally use white rice but if you rather brown Iâ? ?m sure that would work fine). Add hot sauce to taste if desired. This is one meal that is always better the next day. We carry 2 Red Beans and Rice mixes, Panola which consists of everything you need except sausage. The rice, beans, and seasoning are all in separate packets which is easy because the instructions on the pack closely follows the recipe above. The other mix we have is from LA Fish Fry. Their Red Beans mix is much easier and faster to make. Instead of 3 hours you can make this from start to finish in about 1 hour. It has everything mixed into one pack that you just add to boiling water then simmer for about a Â½ hour. Whichever you choose, you are sure to be happy with this original New Orleans meal.